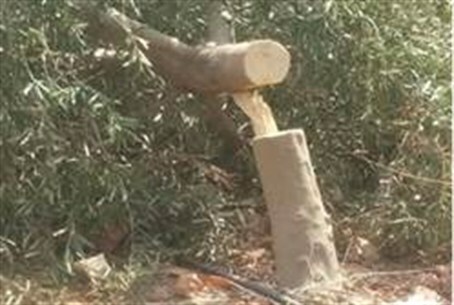 Arabs steal olives from Jewish-owned grove then destroy trees. Victims asks why the media makes Jews the villain. A Jewish farmer went to harvest olives Tuesday morning from an olive grove he owns in the Shilo region. To his horror, he found that the grove had been stripped of olives and dozens of trees had been destroyed. All that farmer Erez Ben-Saadon was left with were broken branches, cloth olive sacks with Arabic writing on them, and spilled olives on the ground. This is not the first time Ben-Saadon has fallen victim to theft and vandalism at the hands of his Arab neighbors. “Last Sabbath Arabs harvested from my trees and stole olives from 40 trees in the same area,” he reported. “It’s outrageous that next to my home in Rachelim, Arabs harvest olives without being disturbed, and yet they attack us in the media, as if we’re plotting against them, while Arab attacks and thefts targeting Jewish farmers in Samaria are met with silence,” he declared. Samaria Residents’ Council head Benny Katzover confirmed that farmers in the region have faced frequent harassment, theft and vandalism during the olive harvest season, as well as attempted libel. “Unfortunately, this serious issue is met with a lack of proper response,” he said. “I call on the legal authorities to take Arab and far-left attacks as seriously as they take Jewish attacks on Arabs,” he added.